Fuel your body with Udo's Choice Organic Ultimate Oil Blend, a certified organic, unrefined, sustainable and vegetarian blend of seed oils, including Flax, Sesame and Sunflower. In today's society, diets often lack the essential fatty acids and omegas required for a healthy lifestyle. 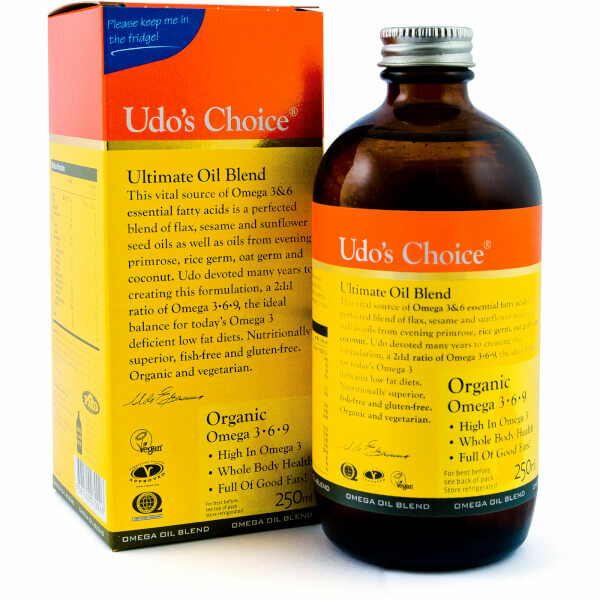 Udo's Choice Organic Ultimate Oil Blend combines carefully selected oils to help supply the ideal Essential Fatty Acid (EFA) ratio of 2:1:1 omega 3, 6 and 9. As the body cannot naturally produce EFAs, it is important we obtain these vital nutrients elsewhere; most omega oils are received through our diets, but food processing and exposure to light, heat and oxygen can degrade the nutritional value of Omega 3 and 6. To help combat this, this organic solution provides a premium source of undamaged Omega 3 and 6 in a perfect ratio that supports optimum health. Fish and gluten free. Organic and vegetarian. Enjoy a drizzle of Ultimate Oil Blend in salad dressings, smoothies, soups, casseroles, porridge, pasta dishes, mashed or baked potatoes, protein shakes and more. Keep Ultimate Oil Blend refrigerated to maintain the freshness.